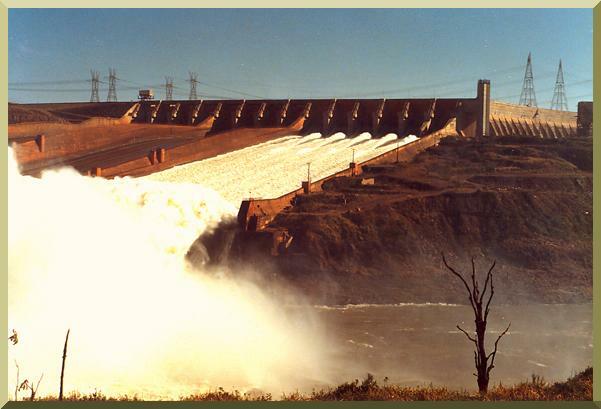 In the late 1980's, I visited Itaipu Dam on the Parana River, along the border between Brazil and Paraguay, accompanied by my friend Newton Carvalho, hydrologist of ELETROBRAS. During the visit, I noticed intently that the three emergency spillways were gated. Curious about this, I asked my host what were they planning to do in the event of a flood. I added: "What if they were caught by surprise, and the flood came when the gates were closed?" He looked at me, smiled, and pronounced: "This is the Parana. When we have a flood, it has a way of announcing itself several weeks in advance. It would be unthinkable to have so many people at the damsite caught by surprise!" I then learned that hydrology has many facets, and that local experience is paramount. on the border between Brazil and Paraguay.